What are the benefits of our ISO 9001:2015 Auditor Training and Consultancy for QMS? The ISO 9001:2008 standard is revised and ISO 9001:2015 is released in September 2015. Accordingly, all companies certified to ISO 9001:2008 must have to update their existing Quality Management System (QMS) to revised standard, within three years of publication of the revised standard. For better understanding of QMS auditing as per ISO 9001:2015, we are introducing ready- to-use ISO 9001:2015 Auditor Training presentation kit designed by our experienced team of QMS consultants. In past years, many organizations and individuals around the world have taken part in our QMS auditor training programs, which we have been delivered using this ISO 9001 Auditor training presentation kit. Our consulting team has worked hard to get relevant information about Quality Management System's auditing, and thereby, trained several teams of internal Quality auditors. This training kit is in editable form, and therefore, quite helpful for companies to create team of QMS internal auditors to upgrade their system for quick ISO 9001:2015 certification. The ISO 9001:2015 Auditor Training Kit is designed to understand the requirements of ISO 9001:2015, auditing process, including audit checklist. It is prepared by a team of highly-qualified management professionals. This Quality system auditor training presentation slides are very useful while conducting auditor training programs within the organization or any work area to deliver information about QMS audit, as per revised ISO 9001:2015 standard. Handouts in the form of write-ups in .docx format are provided for reading and learning of participants. The complete literature divided in 7 chapters can be used as ready reference to the participants. A question bank of over 400 audit questions (based on ISO 9001:2015 requirements) is provided, which can be customized to make your own internal audit checklist. It covers department- wise and all requirement related questions. It includes sample audit forms, including audit plan, audit non-conformity report (NCR) and checklist. It includes sample auditor training certificate. It includes workshops and case studies for evaluation of learning. The soft-copy of presentation and hand-outs are given; one can edit them as per their own requirements. Hand-outs written in word document 2007 and Presentation made in Power point. Developed under the guidance of experienced QMS auditors and consultants. 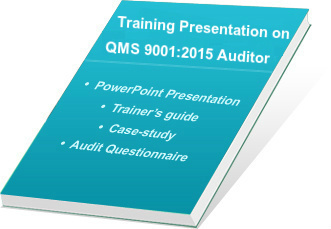 The auditor training kit on QMS is verified and evaluated at various levels by our team and more than 1000 hours are spent in preparation of this training presentation kit.